Stock market crash of 1929 also called the Great Crash, New York Stock Exchange: crowds gathering on Black Thursday, 1929 [Credit: Stapleton Historical Collection/Heritage-Images/Imagestate]a sharp decline in U.S. stock market values in 1929 that contributed to the Great Depression of the 1930s. 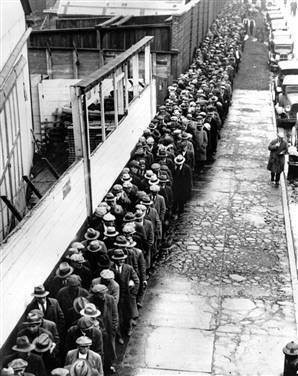 The Great Depression lasted approximately ten years and affected both industrialized and nonindustrialized countries in many parts of the world. During the mid- the to late 1920s, the stock market in the United States underwent rapid expansion. It continued for the first six months following President Herbert Hoover’s inauguration in January 1929. The prices of stocks soared to fantastic heights in the great “Hoover bull market,” and the public, from banking and industrial magnates to chauffeurs and cooks, rushed to brokers to invest their surplus or their savings in securities, which they could sell at a profit. Billions of dollars were drawn from the banks into Wall Street for brokers’ loans to carry margin accounts. The spectacles of the South Sea Bubble and the Mississippi Bubble had returned. People sold their Liberty Bonds and mortgaged their homes to pour their cash into the stock market. 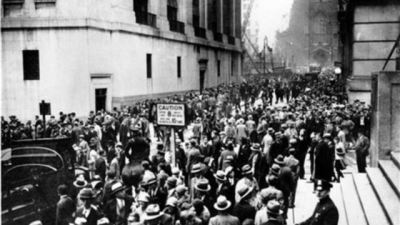 In the midsummer of 1929 some 300 million shares of stock were being carried on margin, pushing the Dow Jones Industrial Average to a peak of 381 points in September. Any warnings of the precarious foundations of this financial house of cards went unheeded. Prices began to decline in September and early October, but speculation continued, fueled in many cases by individuals who had borrowed money to buy shares—a practice that could be sustained only as long as stock prices continued rising. On October 18 the market went into a free-fall, and the wild rush to buy stocks gave way to an equally wild rush to sell. 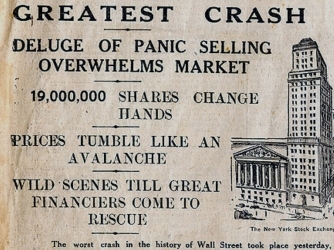 The first day of real panic, October 24, is known as Black Thursday; on that day a record 12.9 million shares were traded as investors rushed to salvage their losses. Still, the Dow average closed down only six points after some major banks and investment companies bought up great blocks of stock in a successful effort to stem the panic that day. Their attempts, however, ultimately failed to shore up the market. The panic began again on Black Monday (October 28), with the market closing down 12.8 percent. On Black Tuesday (October 29) more than 16 million shares were traded. The Dow Jones Industrial Average lost another 12 percent and closed at 198—a drop of 183 points in less than two months. Prime Securities tumbled like the issues of bogus gold mines. General Electric fell from 396 on September 3 to 210 on October 29. American Telephone and Telegraph dropped 100 points. DuPont fell from a summer high of 217 to 80, United States Steel from 261 to 166, Delaware and Hudson from 224 to 141, and Radio Corporation of America (RCA) common stock from 505 to 26. Political and financial leaders at first affected to treat the matter as a mere spasm in the market, vying with one another in reassuring statements. President Hoover and Treasury Secretary Andrew W. Mellon led the way with optimistic predictions that business was “fundamentally sound” and that a great revival of prosperity was “just around the corner.” Although the Dow Jones Industrial Average nearly reached the 300 mark again in 1930, it sank rapidly in May 1930. Another 20 years would pass before the Dow average regained enough momentum to surpass the 200-point level. Many factors likely contributed to the collapse of the stock market. 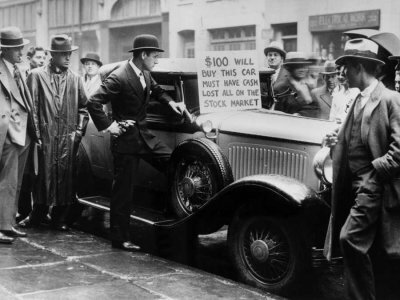 Among the more prominent causes were the period of rampant speculation (those who had bought stocks on margin not only lost the value of their investment, they also owed money to the entities that had granted the loans for the stock purchases), tightening of credit by the Federal Reserve (in August 1929 the discount rate was raised from 5 percent to 6 percent), the proliferation of holding companies and investment trusts (which tended to create debt), a multitude of large bank loans that could not be liquidated, and an economic recession that had begun earlier in the summer.